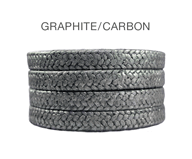 Flexible graphite yarn reinforced with high-purity, anti-extrusion carbon corners with graphite surface coating. Interlock braid. High-purity carbon corners resist extrusion in worn equipment and high pressure applications. Spool stock convenience reduces inventory costs. No end rings in valves required which reduces gland water consumption to 70-90%. Maximizes reliability and stability in high temperatures. Also provides excellent chemical resistance. Dissipates heat quickly: equipment runs cooler and requires less flush water. Less sleeve wear extends meantime between repair (MTBR).